Set on a 250-foot-high bluff overlooking the Mississippi River, Natchez is known for its annual spring pilgrimage of antebellum homes -- those built before (ante) the Civil War (bellum, Latin for war). It wasn't too many years ago that some residents in this very Southern town still called the Civil War "The War Between the States." Even local tour guides sometimes jokingly exaggerate local pronunciations by stretching "War" to two syllables. 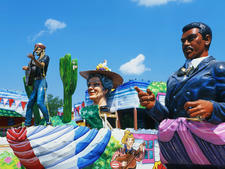 Before "the War," Natchez was a ritzy town for white citizens. It was a cultural center with opera and more, counting among the 6,600 residents who lived here in 1860 as many as 22 millionaires, including cotton and sugar cane plantation owners from Louisiana who established their grand family homes in Natchez. More than 600 pre-Civil War structures still stand, and many have been adapted for use as bed and breakfasts, shops, museums, homes and other facilities. 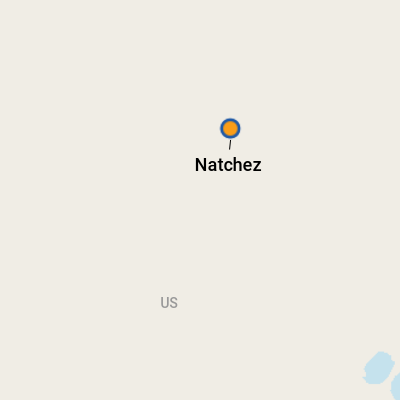 There are so many because Natchez did not fight in the Civil War (unlike those upriver in Vicksburg, which was under siege by Union troops for 47 days before surrendering). A battle between two garden clubs was the biggest struggle for years, but has long been settled in Natchez, which now has about 15,800 residents. 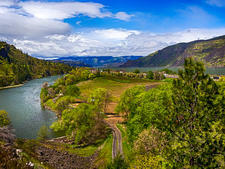 Natchez is 95 miles southwest of Jackson, Mississippi's capital, and 85 miles north of Baton Rouge, Louisiana's capital. It marks the beginning of the Natchez Trace Parkway, a historic forest road without billboards or commercial buildings that extends north to Nashville. American Cruise Lines docks their ships on the opposite side of the river from Natchez, in Vidalia, Louisiana. A shuttle runs regularly between the boat and town. 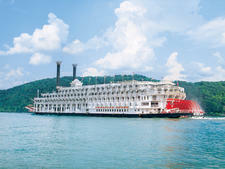 American Queen docks at an area called Natchez Under the Hill, where there are several shops and the Under-the-Hill Saloon. Several ATMs are found after a walk or ride up the hill to the main part of Natchez. The nearest ATM is at the Natchez Convention Center, 211 Main St.; another is at Concordia Bank, 300 Main St. There's also an ATM at Magnolia Bluff's Casino on Roth Hill Road. Downtown Natchez has several restaurants open for lunch and dinner, if your boat is staying late. The Natchez Coffee Company (509 Franklin Street) has Southern staples such as sweet tea, lemonade and sky-high cakes, made on the premises; there's also coffee and wifi. Biscuits &amp; Blues (315 Main Street) has live music, as well as Southern meals such as po-boy sandwiches and BBQ. Under-the-Hill Saloon (25 Silver Street) is a little off-the-beaten track in what was once the city's red light district, but the longer walk or cab ride is worth it for the funky atmosphere and river views; Mark Twain is said to have drank here back in his riverboating days. And finally, if your riverboat has overnight stays (as the French America Line plans), look online to see if Smoot's Grocery (319 N. Broadway) has music. The bar specializes in the Delta blues that make Mississippi famous.